I’m just getting back from vacation. Believe me, I would never let the sun hit me like in this painting. 100-something SPF is the ticket! This is Vincent Katz (born 1960), son of the artist. He is a poet who has published numerous books, including Cabal of Zealots (1988), Understanding Objects (2000), and Fantastic Caryatids (2017). Katz was born in Brooklyn, the child of Russian-Jewish immigrant parents. He studied art and commercial design at the Cooper Union School in New York between 1946 and 1949, the Skowhegan School of Painting in Maine, and under Josef Albers (1888–1976) at Yale University. He chose figurative work very early in his career and has remained faithful to it throughout his life. Katz’s portraits tend to depict people whom he knows: his wife and son, artists, poets, and art critics in his circle of friends. During the 1950s, during the height of Abstract Expressionism, Katz’s portraits were painterly. Eventually, however, his style evolved into what he paints to this day: hard-edged forms; careful drawing; brilliant color applied in broad, flat fields; and radical reduction of forms. The sitters are usually depicted bust-length, often in extreme close up. The large, simplified portraits are reminiscent of billboards or advertising, possibly the influence of Katz’s study of commercial art. 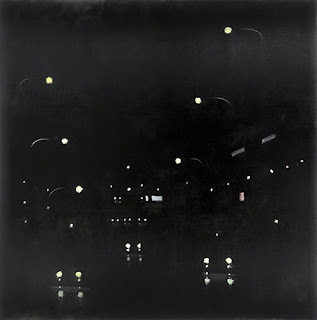 Katz’s simplification of form and contrast of positive and negative space render his work in a class all its own. It is sophisticated in the Renaissance-like compositional skill of the artist. 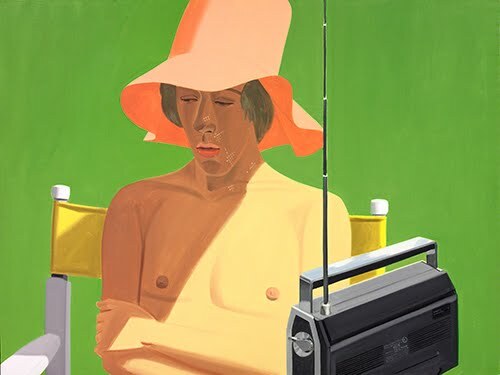 At the same time, it is approachable and endearing because we know—in the artist’s careful definition of individual people—of the artist’s personal connections to all his subjects. Summer Tales shows the artist at the height of his power to draw the viewer into a composition using the simplest of means. 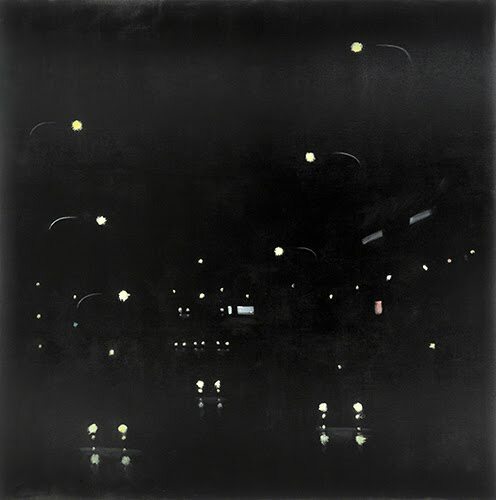 Once you’re convinced you’ve seen all that Katz has to offer, you are confronted by his cityscapes! They follow the same general formula of simplification and suggestion. I find them totally exciting because they are images of New York, where Katz lives and works. These views are so evocative, and yet, share the same emotional attachment to the artist as do his paintings of his family and friends. A colleague with whom I am (temporarily) sharing an office has reminded me that these cityscapes are reminiscent of the shin-hanga (new print) movement in early 1900s Japan. 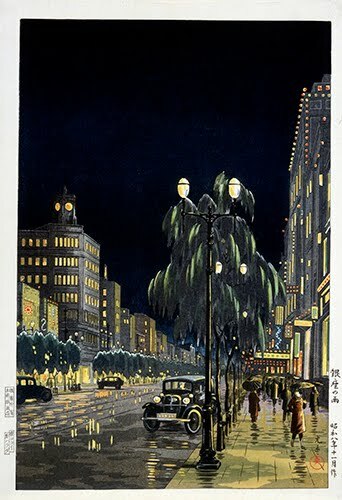 It was an extension of ukiyo-e, but it dealt with modern urban imagery, often with brilliant night scenes.